Let's dive right in to this big laundry pile, shall we? "And whatsoever ye do, do it heartily, as to the Lord, and not unto men. I remember telling a friend, once, that laundry was my act of worship. His response: "Laundry? Worship? That's..quite the interesting perspective!" Absolutely! It can be an act of worship! Contrary to public opinion, worship is not just singing + raising your hands. It is that, yes, but worship is SO MUCH MORE than that. Worship is whatever you are using as an active part of your life to glorify God. This can be anything. Suddenly your whole realm of worship will expand to a whole new level when you realize that it is not what you do, but the spirit + grace of HOW you do it. Make your time in the laundry room, as productive as possible. We should always be looking for ways in our lives to maximize and make the most of every minute. When doing laundry, our hands are busy sorting, loading, folding, etc. We have to (more or less) stay in one spot when doing those things. So with that in mind, what is free/available? Our mind and our ears. Enter the world of podcasts, worship music, and online sermons. *I print out scripture and post it on the cupboards right above where I fold. Obviously it isn't really possible to read the whole time one is folding but I found that this method worked great for scripture memory. Read a verse or two, and then go over them in your mind while you are folding. You can go back and forth with your eyes from the laundry pile needing to be folded, to the scripture posted on the wall/cupboard/wherever, and really not lose anytime. Incorporate scripture memory into your life. Yes, it is good to have a separate, set apart time for scripture memory in your daily quiet time. But it is great to also have it posted around your house/place of work, so that you can see it on a regular basis and spend time going over verses and meditating on them as you go about your day. *Listen to good worship music! Music that draws you to Jesus should be a regular part of our lives anyways. 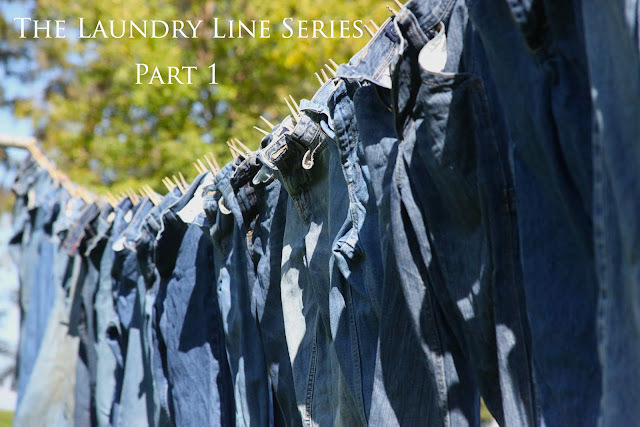 Why not blend our "laundry worship" with our worship music at the same time? You can sing along, or just listen. But it is a great way to uplift your spirit and worship Jesus with your song, while you are working. Next week, I will be talking about how to turn your laundry area into an organized + beautiful place! After all, if you're going to be stimulating your mind + worshiping Jesus in the middle of the mess, you want that mess to be as peaceful and attractive as possible. You think that's impossible? It's not! Come back next Wednesday! Missed the other posts in the series? Click the links below! Thanks for following along! I'd love to hear YOUR thoughts-what do you do while you do laundry? Are any of these tips helpful, and will you be implementing any? Have an amazing day in your laundry domain! I just love this!! You just live your life so well. And you should check out the Goal Digger podcast by Jenna Kutcher!! I've heard about that one-will definitely check into it-thanks! Thanks for this reminder to have a worshipful heart in the midst of Everyday tasks! Amen to occupying the mind! I'll have to check out your podcast recommendations... some I like are Radical & (Moth Radio Hour *with discretion). Also, if you need to talk to someone on the phone, a speaker phone/headset are so handy to let your hands stay busy! Love this! I now pretty much love saying verses whilst folding laundry. I mean, what could be better? Love your sweet example of turning EVERY task from a chore to a privilege. a way to bless your loved ones + worship Jesus. Having seen mothers in Mexico wash in the river made me so aware of those who have little water and no easy way to keep their families clean and healthy. I pray for them every time I use my convenient washer. That is so true, and what a great reminder to pray for them! Thank you for this post, I did not know that set apart girl had a podcast. Yes, they do! It is fairly new, I think. So excellent-I would highly recommend it! This is such a good perspective on laundry, Chelsy! I think I tend to look at laundry as a necessary evil that just has to be done. I do like to listen to music while I am folding clothes and your family's cd Time for Truth is always first pick!! I love all the songs on there and I have memorized most of them so I love to sing along! Thanks so much! Very interesting! I never thought to view mundane chores like laundry or dishes as an act of worship. Looking forward to the rest of the series. I thought this was an interesting subject, but I was so excited to see what you would have to say!! I worked at a children's home in Bolivia, and laundry was my specialty. I was in charge of it, and anyone else who helped, worked under me. I was the one who knew which piece belonged to all 20+ people (including frequent visitors). It was a huge job and sometimes I got tired of it. But more consistently than not, I loved my responsibility & never regretted allll the hours I poured into it. It was to me an awesome way to be part of everyone's lives, and my time wasn't wasted. Also, in a setting where I didn't get my quiet time, my laundry space was my favorite thinking/meditating/prayer time. This post was very encouraging - thank you! I love the podcast suggestions. I was just thinking about how I need some encouraging audio sermons to listen to. Do you have any music album suggestions (along with your family's music lol! )?